I’ve made it thirty pages in and haven’t really talked about guns once. It wasn’t a conscious decision to avoid discussing firearms, it’s simply because they haven’t made too many appearances in Long John so far (a fact I’m proud of because––like any weapon in a story––they can become easy plot devices by resorting to violence). But I first wanted to talk a bit about violence. 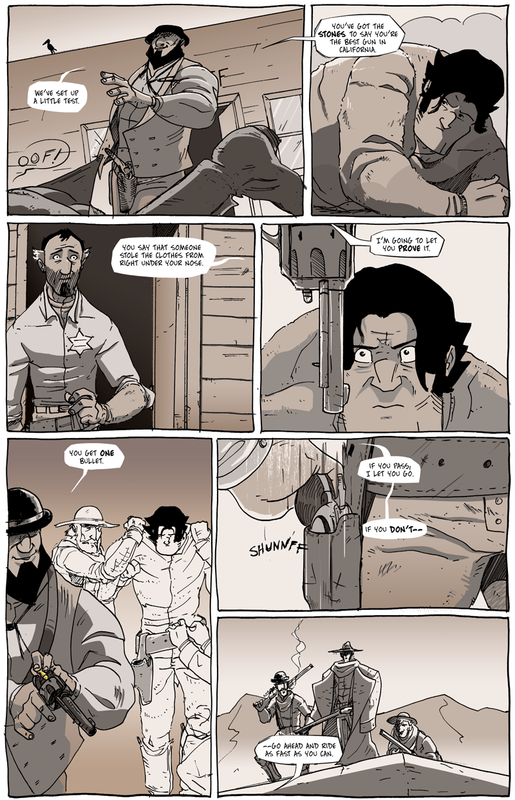 People would say (though I haven’t heard any comments to this effect, yet) that Long John is not a violent comic if only because it’s a western and, as of the first thirty pages, only one bullet has been fired amid pages and pages of glares and one-sided talking. Westerns are known for their big shootout set pieces, no doubt, but I actually want to stay away from those. There will be big, dramatic set pieces, but I want to stay away (as much as possible) from the shooting-from-behind-a-barrel, sneaking-down-the-alleys-between-buildings, shoot-till-you’re-out-of-ammo gunfights if only because that’s what popular culture almost expects out of a western. However, I’ve seen enough of those and even if the movie or story is good I find myself getting quite bored in big action scenarios like that. I’m much more intrigued by what is being set up here––a “one bullet” scenario. Sure, we already know the answer––we know he’s the Long John everybody talks about, so we know he wins. I’m fine with that. But how does he win? Will it be clean or will it be gnarly? Will it be utter destruction or will it be surgical? Will people come to his aid? Will he be chased down? All of these questions are at the core of the story I want to tell: even though we never met the old one, how will the new Long John adapt to this world? It wasn’t until I was drawing this chapter that I realized how violent I had actually made it, but I’m okay with that. Especially in “Sunza,” I really wanted to see how far I could go in the “put your character through hell”-type of storytelling. I think it’s safe to say that Long John has not been enjoying his stay in Poverty Flat. However, the violence extends beyond the beat-down, beyond the constant pushing and falling. The attitudes are violent, the tone is violent, the words are violent as are the postures and the stares and the buildings. In that sense (to me, at least), I am surprised at how violent I was able to make it with only firing one shot (soon to be two, at least). I’ve said it before and in many places: drawing is hard, but it’s nice to look back at a series of pages––of story––and feel satisfied with what I’ve done (that’s on top of still seeing all the mistakes and errors I’d love to go in and correct) by making a violent––but not bloody––story. The gun being offered to Long John is the classic Colt 1873 Single Action Army “Model P,” commonly referred to as the “Peacemaker.” It originally was released in three barrel sizes: 4.75″, 5.5″, and 7.5″. Because it was easy to draw from a holster, the 4.75″ was a popular purchase for gunfighters. The way it tends to work is that the longer the barrel the more accurate it’ll be at a longer range. So, the smallest barrel was a bit unreliable beyond a dozen or so yards. I originally thought about giving Long John (both in his pre-page 1 existence and now) a Colt with the 7.5″ barrel (colloquially referred to as the “Cavalry” model), but resorted (in my head, mind you) to give him the middle ground 5.5″ model if only because the rifle distance that Long John is supposed to be able to hit with a pistol would be admirable (and probably impossible) with the Cavalry, but it would be legendary if he could do it with the Artillery. Plus, it’s a comic…I can do what I want. I assure you, I’m not diligent enough to say that the pistol we see in panel four is to scale with the Artillery model, but it’s clear it’s a revolver and that’s good enough for me. On this page we also see Muller and his cronies on the roof with some Henry rifles. There’s no philosophy behind that choice aside from being relatively easy to draw. As far as the other firearms we’ve seen––for what it’s worth––I’ve outfitted Muller with a standard Remington revolver because of its signature “wing” or “blade” beneath the barrel which make the gun look a bit more sturdy and larger than it actually is (just like Muller and his clothing). Boss Fleming is outfitted with two guns, an as-of-yet unseen revolver on his hip and the phallic sawed-off shotgun hanging in front of his crotch (a weapon that was unspecific but modelled on one that is era-appropriate). Personally, I am really fond of the aesthetics of single action pistols (the kind where you have to pull back on the hammer with your thumb or free hand in order to be able to have a trigger-pull fire a round), and equally admire the skill it takes to effectively use one. Not to bring up Yojimbo again, but the way single-action revolvers can be used is similar––in a loose, ill-fitting way––to samurai sword-fighting, and I really enjoy working out the parallels between gunfight showdowns and the Japanese sword practice of iaijutsu––the art of drawing the sword from its scabbard and attacking in the same stroke. Perhaps it’s because I have watched and internalized so many samurai films and read so many books about samurai culture (and even books about kenjutsu) long before I ever cared about westerns––and it can be safely said that gunfighter culture never became as organized or philosophized as samurai culture, though I would love for that to be the case––I guess it’s natural that I approach weaponized violence in Long John in a similar way. To me, it’s a more interesting way to approach a high-stakes gamble, one that involves real skill not just blind firing and a big wish.